In a year where smartwatch momentum has lost some of its steam, smartglasses have made a surprise resurgence. The hand of wearable tech giveth and it taketh away. Snap Inc's Spectacles played a big role in this, amping up hype that even wearable fans like ourselves couldn't predict. A campaign based on artificial scarcity helped it along, but it's hard to deny that the user experience was compelling too. It turns out that with a strong enough angle, smart eyewear can in fact achieve great things - Oakley's Radar Pace glasses were another good example of this. So where to next? Are smartglasses now destined to be the big wearable event of 2017? Nobody out there knows better than Vuzix, and nobody within Vuzix knows better than CEO Paul Travers. Since 1997 (it was named Icuiti for the first ten years), Vuzix has been quietly working on the smartglasses revolution with a focus on enterprise - a low hanging fruit, Paul admits - building devices for helping professionals in warehouse logistics, healthcare, quality assurance, and even the military field. Almost all of them have been fashionably questionable, which is fine when nobody else sees them, but it's also given Vuzix the time to build slowly towards the consumer. At CES 2017 it will be demoing its new pair of specs, the Blade 3000. This marks a midway point between business and the everyday user - what Paul calls the "prosumer" - for consumer-facing professionals; doctors, dentists, secretaries etc. 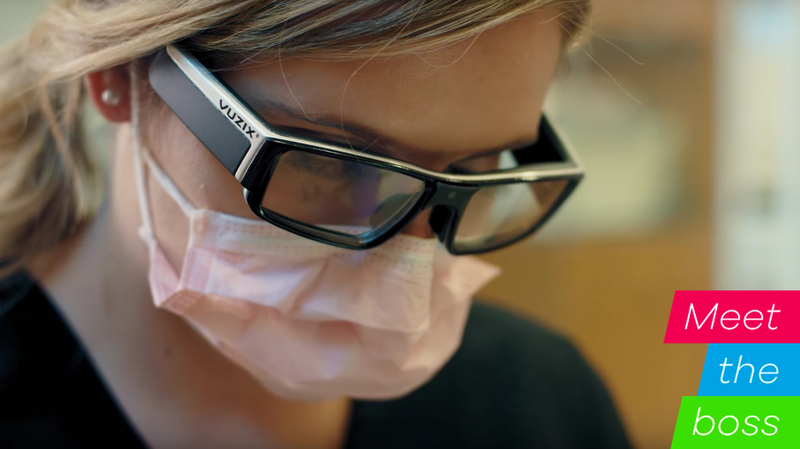 Using Vuzix's waveguide technology they'll provide a digital display onto the lenses, providing anything from GPS navigation data to patient information, to Skype video calls and HD movies. They're notably more stylish and averse to Glasshole-name-calling than what Vuzix has offered so far, but don't expect to see teens hopping in helicopters to the Grand Canyon for a pair. It's more of a step process towards what's next, when Vuzix heads to the consumer market. "They can't look like Google Glass," says Travers, "they can't look like HoloLens, the tech has to disappear." He tells Wareable that we'll probably see Vuzix in the consumer space before 2017 is over, "but in 2018 certainly"; the smartglass revolution may hit us sooner than we thought. "We have third party partners that will probably band it with their name, who will be going after that space," adds Paul. "In the long run it won't just be Vuzix. We've already announced some relationships. Although we can't talk about names, there are already other folks that are involved." Partnering seems sensible: Vuzix holds the know-how but lacks the big brand name. With speculation that Apple, Google (again) and no doubt plenty more have plans for augmented reality and/or smartglasses, drawing on Vuzix's expertise could be better than going it alone. Unknown to many, Vuzix was quietly helping Google work on Glass in its early days. "We did a bunch of stuff with Google when they first started," says Paul. "In fact some of the first stuff guys were jumping out of airplanes with, it was all Vuzix." Paul's excited about bridging the gap to consumers, and closing the chasm between the virtual and physical. "If you look out down the street and there's a balloon floating over the ATM, it'll be really easy to spot," Paul says, offering an example of AR in practice. "It's the beginning of closing the connection between the digital world and the real world. And not having to take your phone out of your pocket to do it." And lest we forget Pokémon Go, which proved just how brilliant and captivating AR can be. "With a smartwatch you can't really connect the digital and real world together," Paul adds, but he thinks bringing these together with a pair of glasses is "going to incredibly compelling... much more so than VR." "In VR you put your head in a bucket - don't take it the wrong way, we make VR products - but you do, and you're isolated from the real world. I'm convinced it's going to create really great experiences, but it's going to be in a confined space. But AR, it's going to be everywhere. And we're seeing that right now in enterprise." Cost is obviously another concern, but maybe not as much as we think. For $130 Snap's Specs seem dear for a pair of quirky shades that perform one function, but demand remains high, and Paul believes a $300-$500 price range feels right for consumer smartglasses. That would be at least double the cost of Snapchat's specs, but then the functionality would be tenfold. "If the experience is good enough, I think people will pay 500 easily," says Paul. "It's different to Snapchat glasses which record just a short video - [AR smartglasses] will do a lot for you." "When it's right, it's just going to make so much sense for people."